96% Viscose and 4% Spandex. Printed in HD with supreme extra quality. Resistant to the washing machine. Lay garment flat (face down). 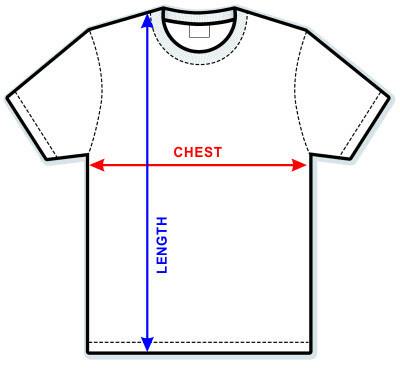 Measure from center back neckline seam straight down to bottom of the front hem. Lift your arms slightly and measure from under your left armpit to under your right armpit, crossing over your chest. PayPal Holdings, Inc. is an American company known for being the safest payment method on the Internet. We use Authorize.Net, a United States-based payment gateway service provider allowing merchants to accept credit card and electronic check payments through their website and over an Internet Protocol connection. Shipments to U.S. take from 7 to 10 business days in average. With your order, you will receive a tracking number so that you can track your package at any time, anywhere. If you are not satisfied with an item, you have 30 days after receiving your order to change it for any size or request a refund. It's very simple! We offer free returns for all orders! We want you to be completely satisfied with your purchase. You can opt out of the Newsletter at any time by clicking the unsubscribe button located at the bottom of every email we will send you. Your personal information will not be shared, sold or rented. Mon-Sun, from 8am to 11pm you can contact us at support@sugarcane1977.com or chat with us by clicking the floating sign, in the left corner of your screen. Orders take up to 5 working days to be prepared. This days do not count as "Shipping Time". Orders arrive to U.S. between 7 - 10 working days after dispatched the package. We gladly accept returns within 30 days of receipt of your shipment. Discover all details in the Customer Care area. Albrook Mall, Pasillo del Hipopotamo segunda planta frente al local comercial "Zara", en Panama City, Panamá. We work with male models that are ~182cm tall and ~77kg. They always wear size S.